This post is sponsored by our friends at Primal Kitchen. A side salad for ALL to enjoy! 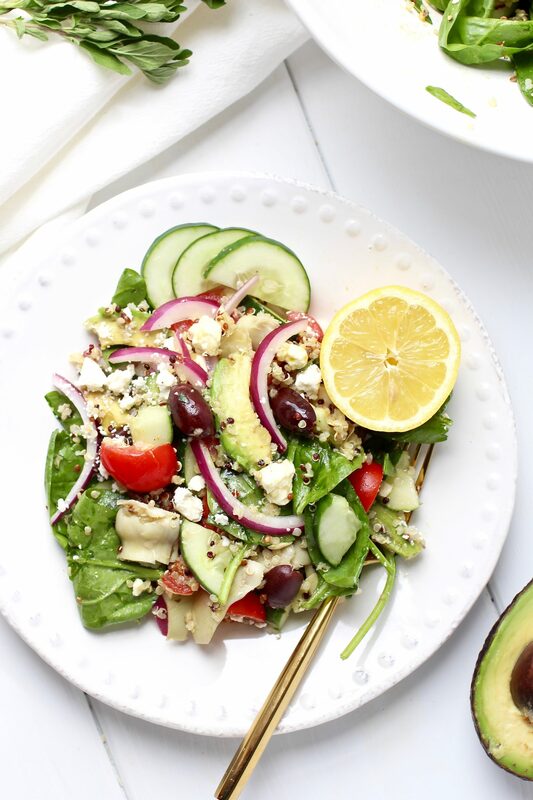 This gluten-free Greek Quinoa Salad is made with our favorite Extra Virgin Avocado Oil. Perfect for lunch packing, end of summer picnics and tasty side-dishes. This Greek Quinoa Salad has been a long time go-to of mine. It always receives rave reviews and results in a number of recipe requests. It’s one of those salads that I just throw the ingredients in a bowl, not paying attention to the amounts and wallah….a delicious salad is made! However, because I wanted to share this recipe here on the blog – it’s just too good not to, I finally took measurements of the ingredients. But really, you can never go wrong with a good salad that’s chock full of Greek inspired ingredients like ceamy feta cheese, kalamata olives, artichoke hearts, cucumbers, cherry tomatoes & fresh herbs and then tossed in the easiest vinaigrette ever. Add 3-4 oz. chopped chicken per serving to turn this side salad into a satisfying entree salad. Can you say, ‘perfect lunch’! 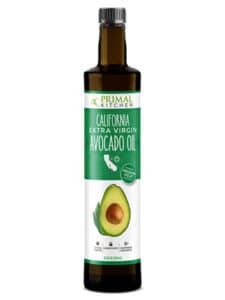 Primal Kitchen Extra Virgin Avocado Oil taste good and does the body good! It has a nice light and nutty flavor that’s not overpowering and is perfect for drizzling on salads, baking, cooking and sautéing. The oil is made from avocados that are freshly picked and pressed from premium California avocados. Extra Virgin means that the oil is minimally processed which helps to keep the delicious flavor, aroma, and nutrient-density. You can see just how minimally processed the oil is by its beautiful emerald green color. Note: if baking with avocado oil – it may alter the color of the baked goods. You can purchase it here. Use coupon code REALFOODRDS for 10% off your entire order. Lower the risk of some cancers. Read more on healthy fats here. Substitute Primal Kitchen Greek Vinaigrette for Primal Kitchen Extra Virgin Avocado Oil and lemon juice. 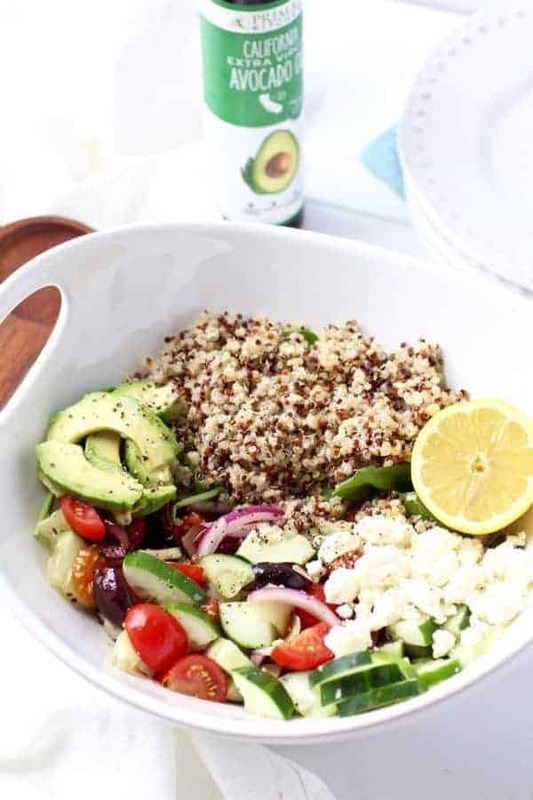 You can also make this Greek Quinoa Salad with Primal Kitchen Greek Vinaigrette and it’s just as delicious. It may be my most favorite vinaigrette of all. 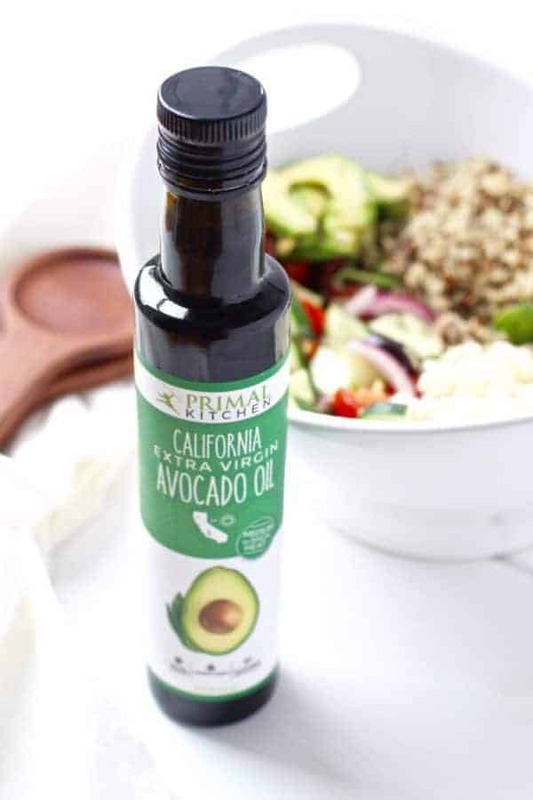 Like the other Primal Kitchen products, it’s made with avocado oil as well as a blend of greek seasonings and has no sugar added making it a perfect Whole30-friendly option. 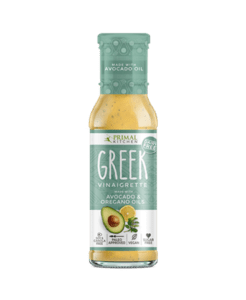 This dressing doesn’t last long in my house so I suggest you stock up with the 3-pack deal! If you follow a paleo or dairy-free diet, feel free to omit the quinoa and the feta. 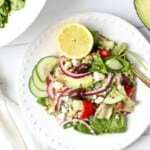 By doing so, you’ll also end up with the most delicious Whole30 Friendly Salad! Alrighty! I hope you’re as excited about this Greek Quinoa Salad as I am! 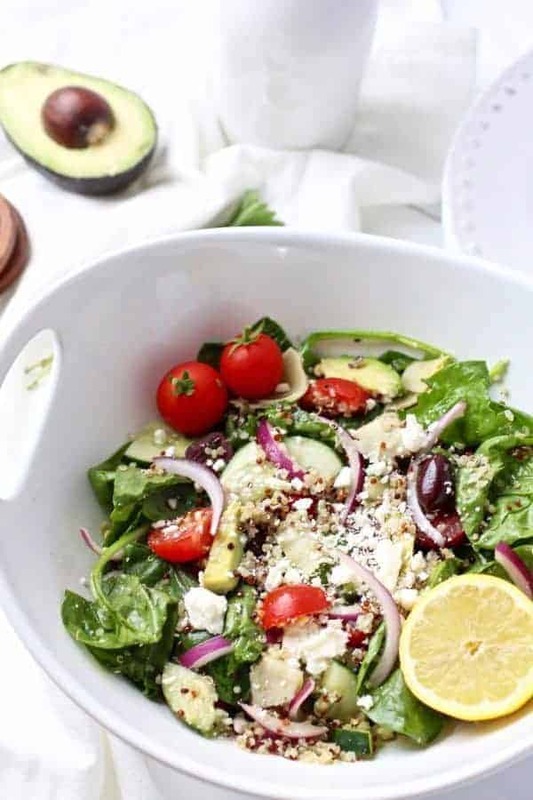 This gluten-free Greek Quinoa Salad is made with our favorite Avocado oil. It’s perfect for lunch packing, end of summer picnics and holiday side-dishes. In a large bowl. Combine all of the ingredients. Greek is my favorite cuisine, what is yours? Comment below. This post was made possible by our friends at Primal Kitchen. Through we received compensation for this post, the opinions expressed here are 100% our own. Thank you for supporting the great companies we works with thereby allowing us to continue creating great recipes and content for you.